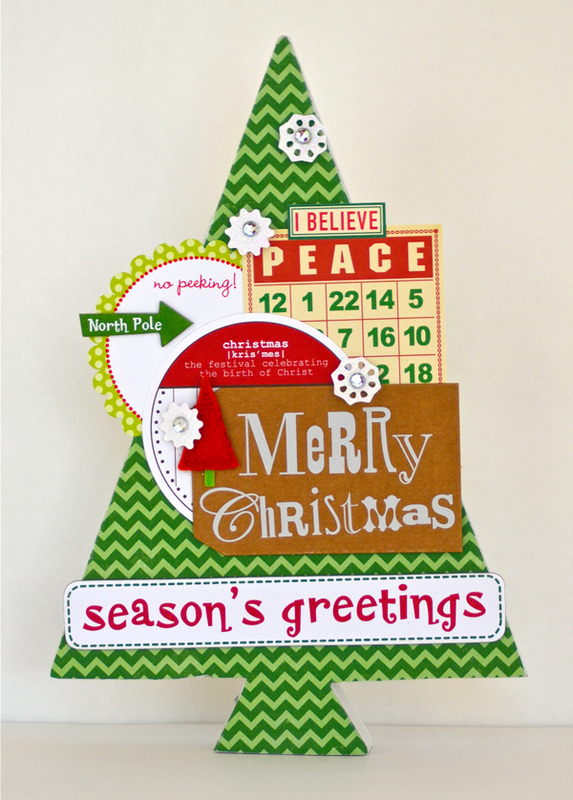 Anyone else thinking about decking the halls for Christmas? Craft stores have been trying to push us in that direction since early summer (and I wasn't ready then). 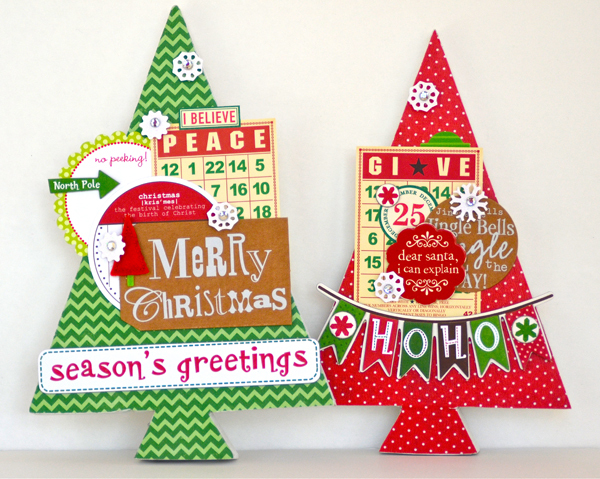 I started gearing up after my hubby cut some wood tree shapes for me to decorate. This project is the result. The trees are just over 1/2" thick and are free-standing. I pulled out a bunch of random embellishments to decorate these, along with some Echo Park Holly Jolly papers. The green tree is 9" high and 6" wide (at the base of the tree). 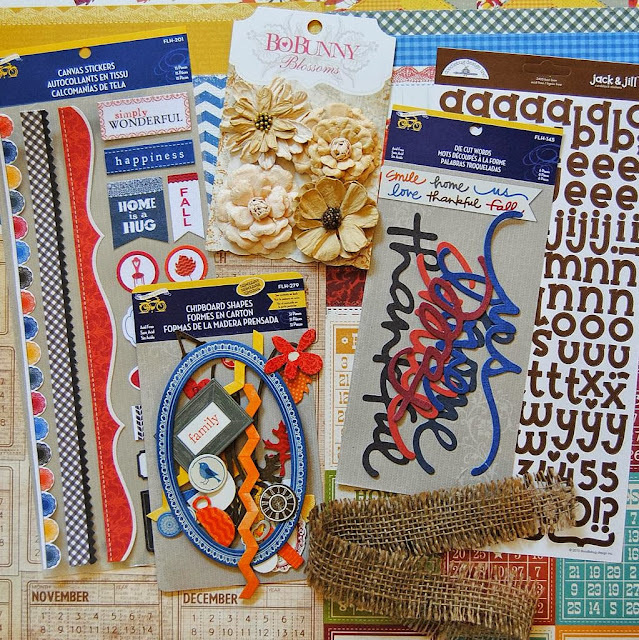 I hope you were inspired to start on some holiday crafting. Thanks for stopping by today. I'll be back with a card share tomorrow. We have a new linky party going on over at Paper Issues. 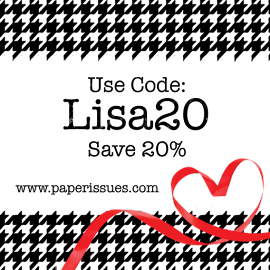 We want to see your Ruby Rock-It projects OR a project having to do with fall, love or weddings. Your project doesn't have to be new and you can link up as many times as you'd like. Ruby Rock-It is giving away a prize pack of their new At Last collection. 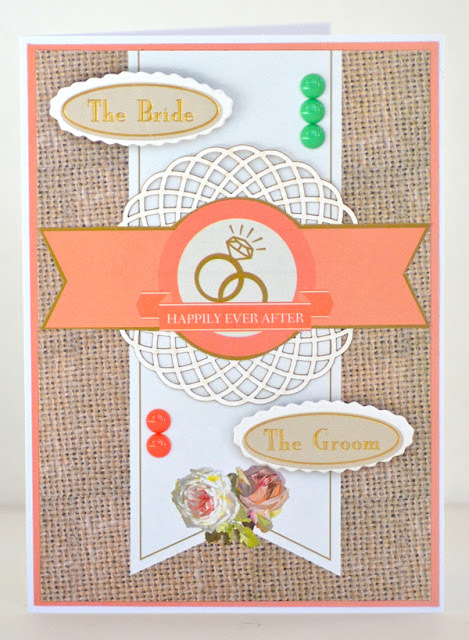 I used the At Last collection to create the layout I shared yesterday and I also made a card for a friend who is getting married in a couple of weeks. 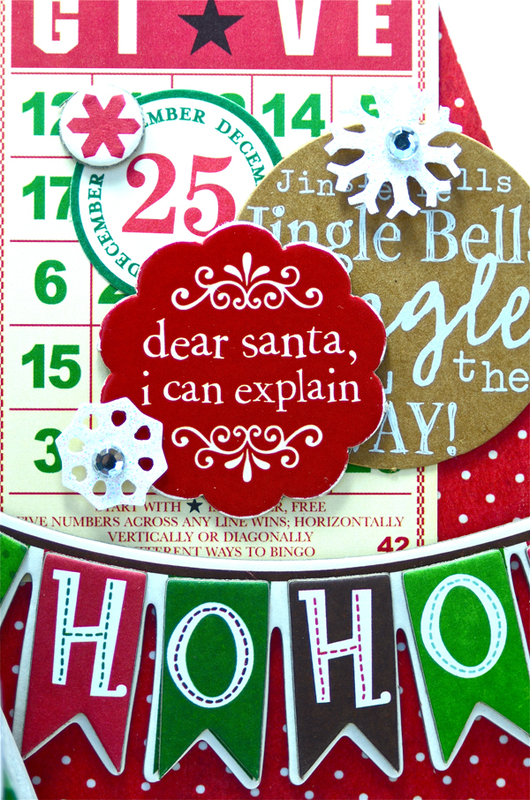 I kept it pretty simple, using just patterned paper (some pieces are fussy cut), die cuts, a doily and enamel dots. 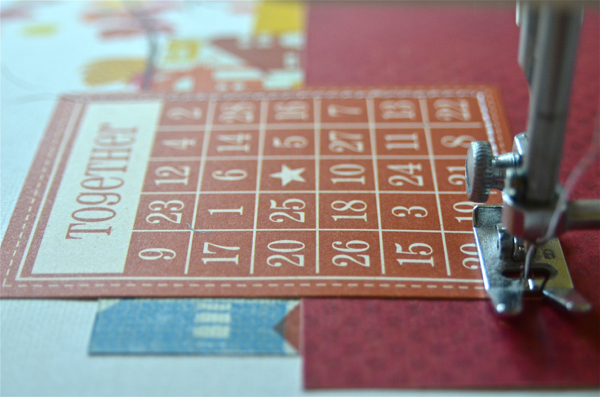 We have a brand new challenge starting over at Paper Issues today (running through November 10). It's called Fallin' for You. We want to see your Ruby Rock-It projects OR projects about fall, love or weddings. Your project doesn't have to be new and you can link as many projects as you'd like. 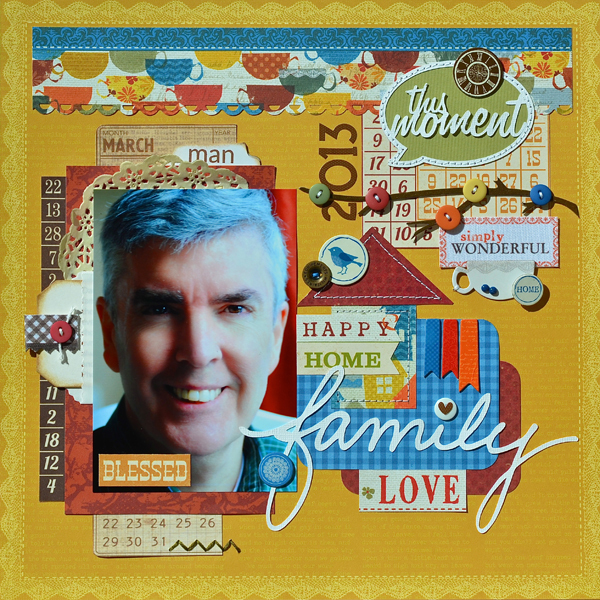 I used Ruby Rock-It's new collection, At Last, to create a layout featuring a special photo of me with my Mom and maternal grandmother (I called her Grammy) on my wedding day. The colors in this collection worked perfectly with all of our outfits and my bouquet. So don't be shy. Come check it out! I'd love to see some familiar names linking up. Ruby Rock-It is giving away a prize pack full of their At Last collection to one lucky participant. Good luck! 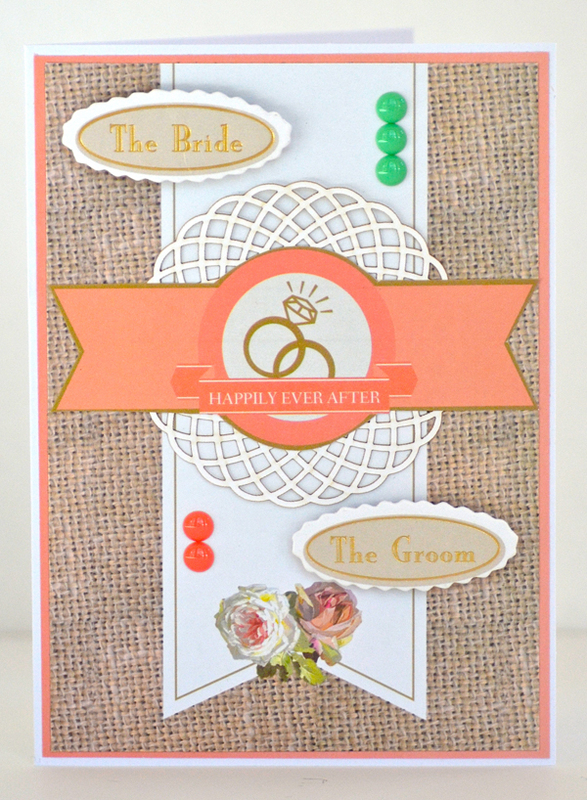 I'll be back tomorrow to share a wedding card I made with the At Last collection. 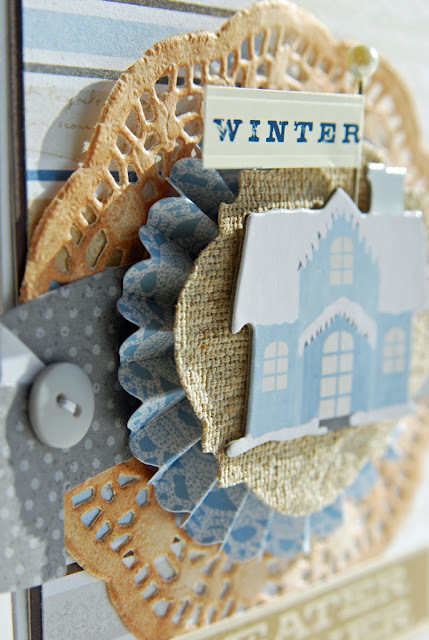 Linking up to: Curtain Call Inspiration Challenge. 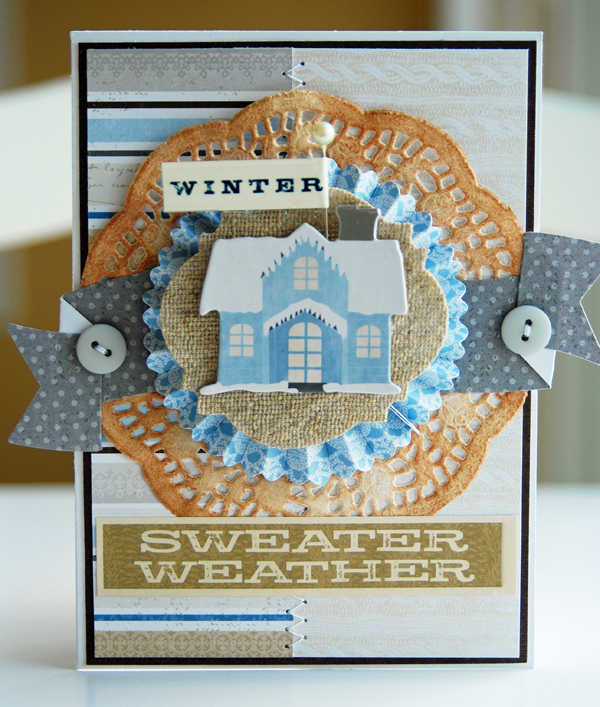 I created this card back in February for a winter call but it didn't get picked up. I figured now was a good time to share it. It may not be winter yet here in upstate NY, but we've definitely had some sweater weather (and snow is in the forecast for tomorrow!) How about you? 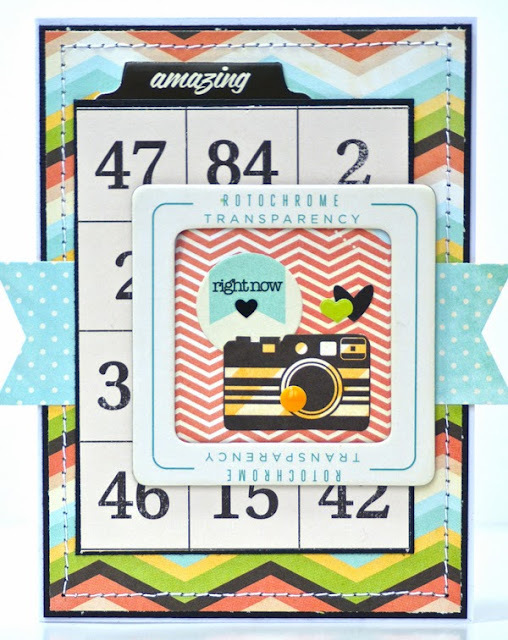 Just a real quick post today to share an all occasion card made with Fancy Pants Memories Captured. 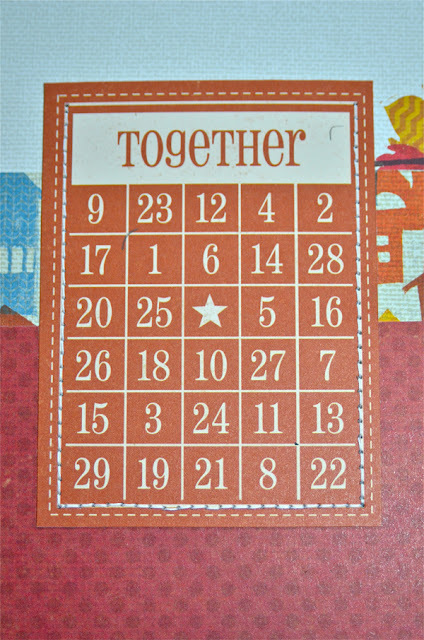 The bingo paper is an oldie, but goodie, from October Afternoon. 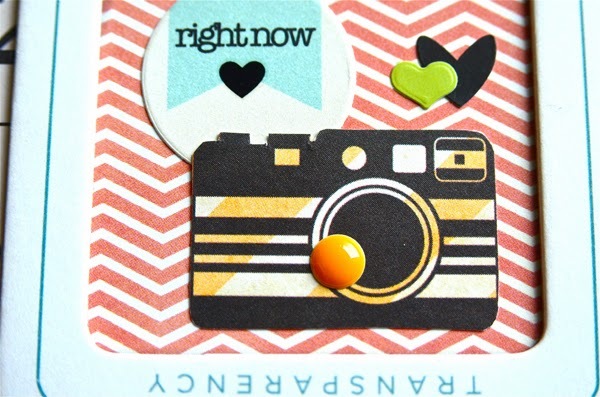 I cut a camera from one of the Fancy Pants papers and used it as the center point for a grouping of embellishments inside the frame. Thanks for stopping by today! I'll be back on Monday to share a new layout. Alexa is quite the animal lover. She already has plans to go to Cornell University's School of Veterinary Medicine to become a vet (the girl has expensive taste in education, doesn't she?) It probably hasn't helped that we take her to Cornell every year to attend an open house specifically for kids who want to have a career in animal care. Hi everyone! Happy Tuesday! A few weekends ago, I attended an all-day crop with some of my friends. 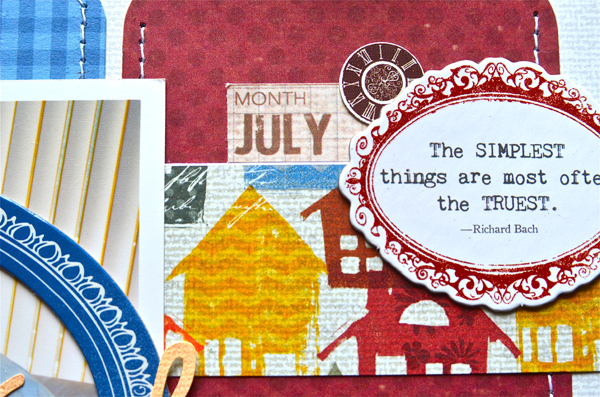 In between laughing, talking and eating, I got a bit of crafting done, including this layout. This page is about some of my home decor. Although it appears as if I've decorated for fall, these items are on my kitchen table year 'round. I love fall colors so there are shades of green, cranberry, orange and yellow throughout my house. The hand painted pitcher belonged to my Mom. It was one of her favorite pieces. There are many memories surrounding it and I love being able to display it. To add a homey feel to the page, I used embellishments with a lot of texture, like cork, metal, canvas, wood and burlap. There's even a doily tucked in there too. Have you ever done a page about your home decor? A treasured item perhaps? How would you like a chance to win this brand new set of Heidi Swapp Color Shine mists? 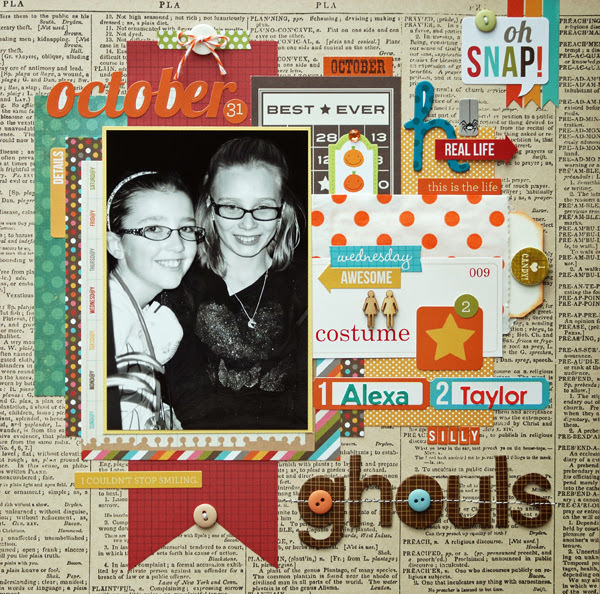 Come link a spook-tacular project up to the latest linky party at Paper Issues (called Halloween Hootenanny) and you might be the lucky winner (plus your project may be featured on the blog). Get all of the details right here. 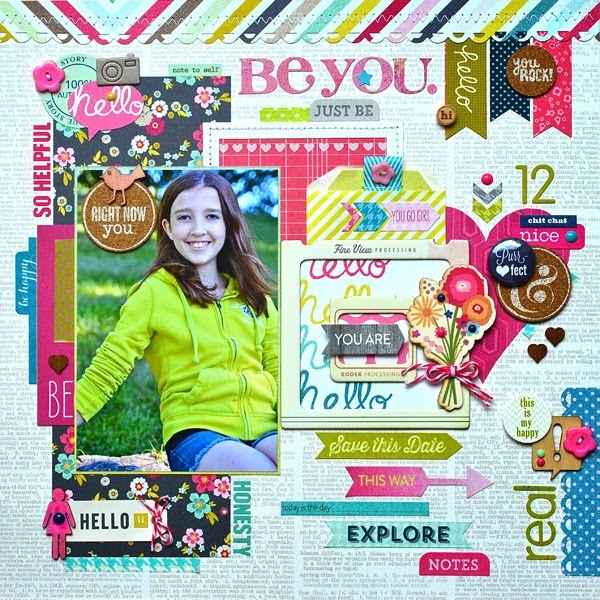 I'm not eligible for the prize, but here's one of the layouts I linked up. It's from last Halloween. While you're over at Paper Issues, be sure to check out the Halloween category in the store. You can use my code LISA20 to get 20% off all the treats you want. Enjoy! Hi everyone! I shared this tutorial on My Creative Scrapbook's blog and I thought I'd share it with my readers as well. Today I'm here to show you how to turn a bingo card into a journaling pocket. 1. Cut the desired card from bingo patterned paper (this particular one is from Simple Stories Harvest Lane collection) and adhere to your layout. 2. 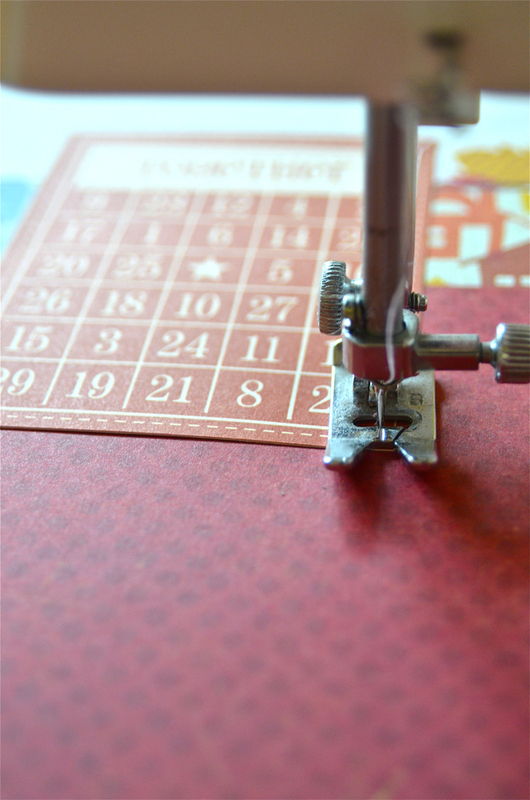 Machine stitch around THREE sides of the card, leaving the top open. 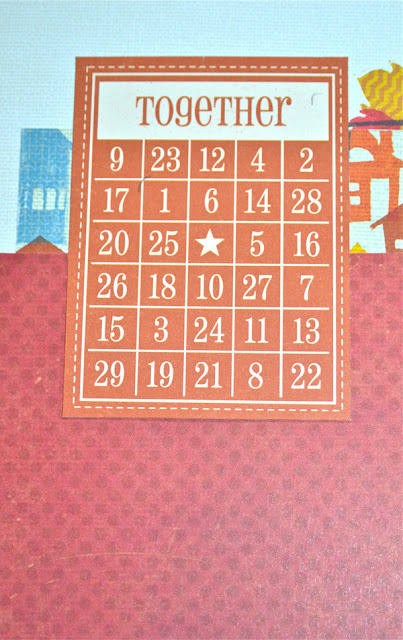 In this case, I used the grid border just inside the pre-printed "stitching", as my guide. When I don't have a guide, I use a ruler and lightly draw pencil lines to follow. Two sides sewn, coming around to the third (and last) side. Even though all of the stitching may not show on your finished page, be sure to sew all three sides to make the pocket sturdy. 3. All stitched on and ready for a journaling tag. 4. 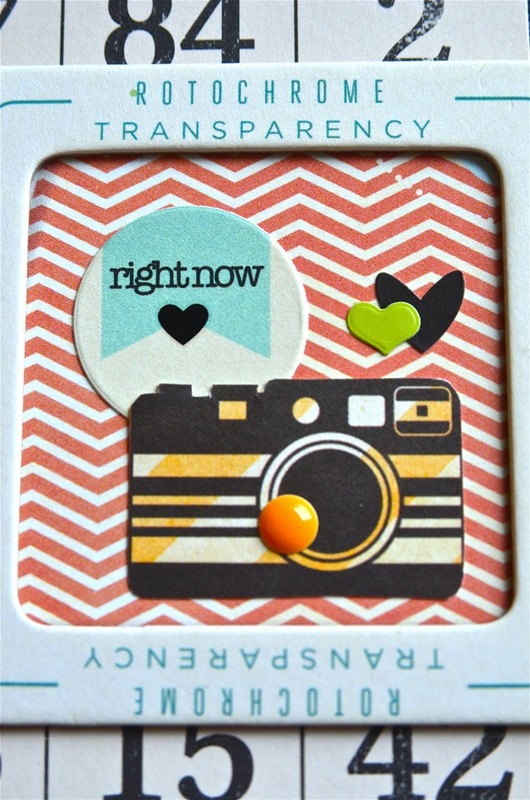 The finished page with journaling tag tucked in. 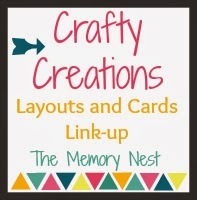 If you're looking for the My Creative Scrapbook blog hop, please go here. 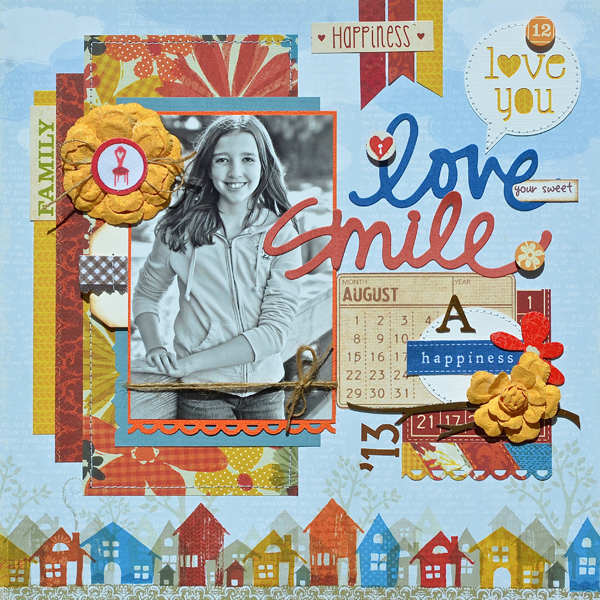 Today I'm sharing a sweet page about Alexa, made with October's creative kit from My Creative Scrapbook. 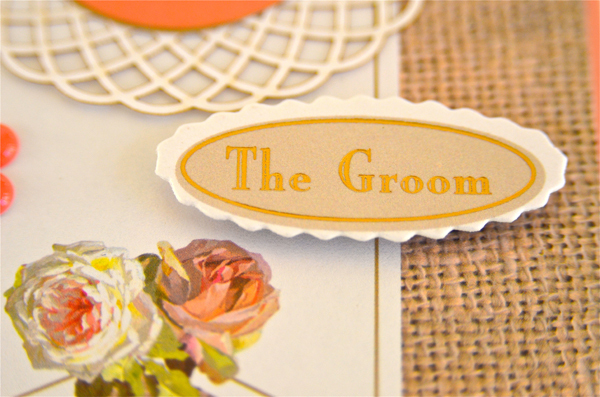 I used two diecut words to create my title, filling in the remainder with text printed on white cardstock. 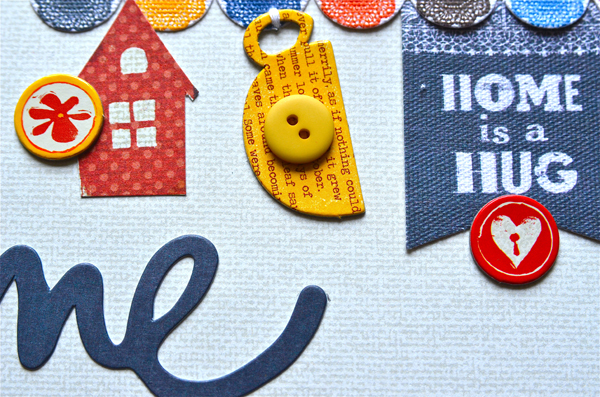 I wanted to add Alexa's initial to the page but the letters in the chipboard pack were intended to spell the word "LOVE". I had to get creative. What did I do? I turned the "V" upside down, cut a small cross piece from the "L" and created a custom initial. I'm really pleased with how it turned out. The kit included a long length of mesh-like burlap ribbon. I pulled the longer, horizontal strands out of the burlap so I would have some twine to work with. 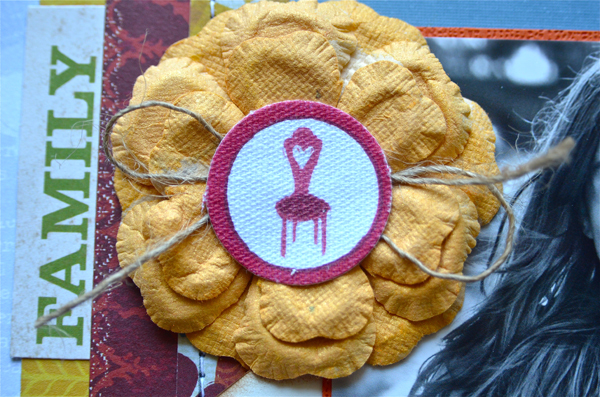 I added a twine bow to the larger flower and wrapped some around the photo as well. 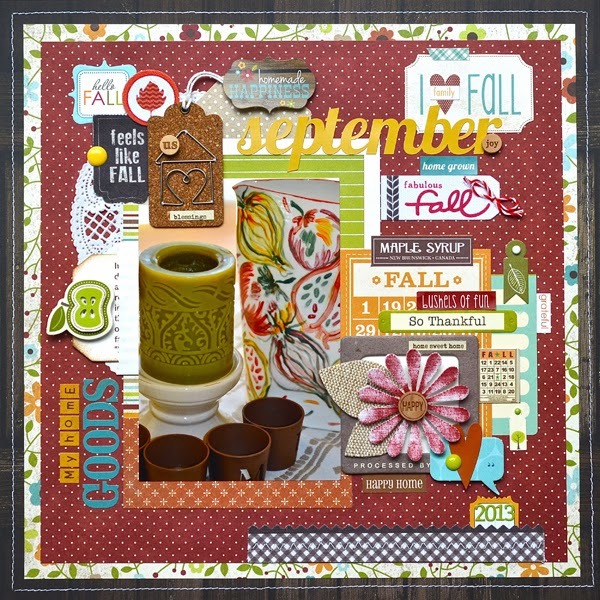 So this is layout number three with this month's kit. I'll be back tomorrow with my fourth, and final kit layout. See you then! 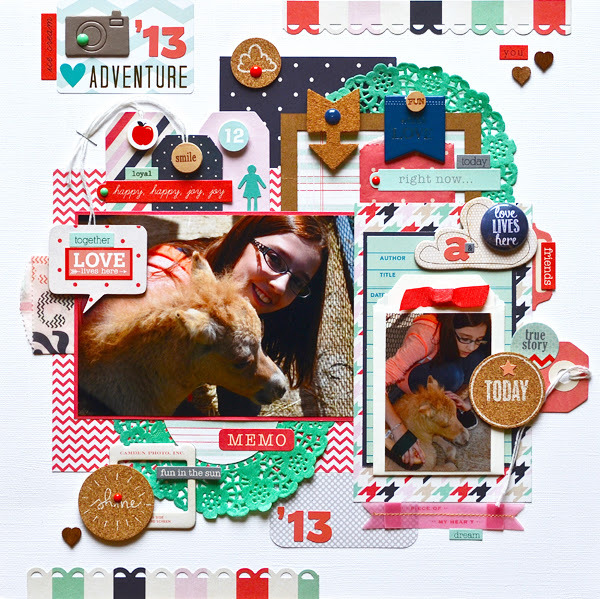 Today I'm sharing another page I designed with this month's creative kit from My Creative Scrapbook. The photo is circa 1999. The journaling (in the red pocket) talks about how my Mom's house was always the gathering place. I miss her and I miss those times. 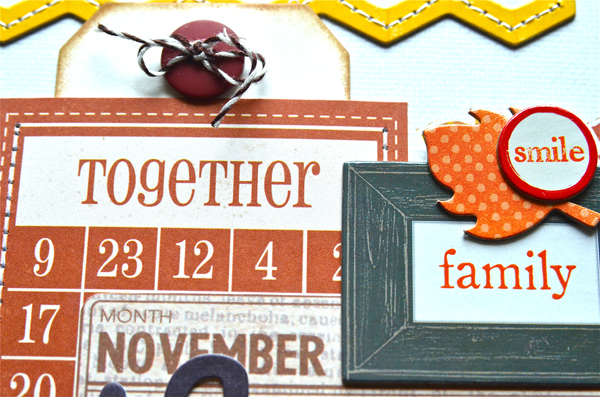 To give the page a homey feel, I created a banner across the top edge of the page using canvas stickers, chipboard, and a house cut from one of the patterned papers in the kit. I added dimension to pre-printed objects by using chipboard and buttons. 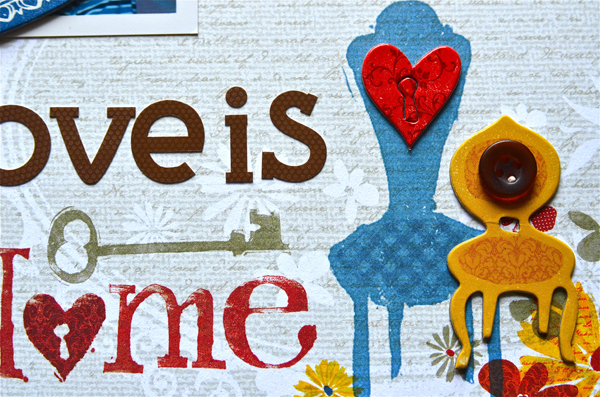 I also worked the title into the word "home", which is printed on the background paper. Here's a closer look at the layering on the journaling pocket. The clock piece was punched from product packaging. I'll be back tomorrow with another layout to share. Have a great day! Happy Monday! 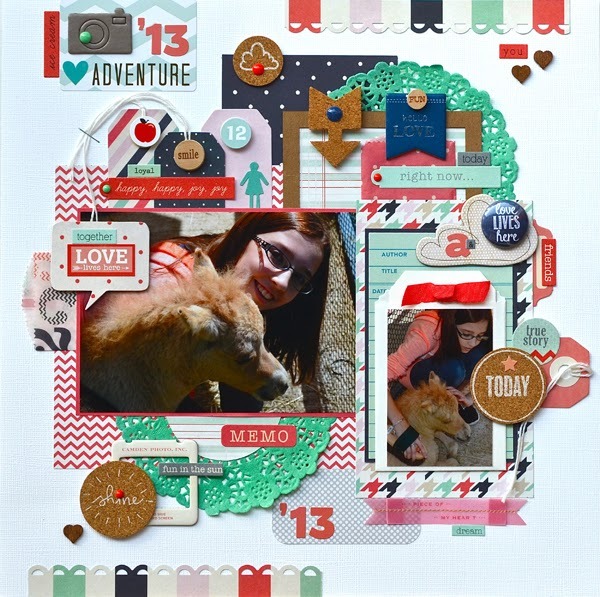 Today I'm sharing the first layout I made with the creative kit from My Creative Scrapbook. This page is about last Thanksgiving and the quality time Alexa had with some of her cousins (she's snuggled in there, third from right). 1. 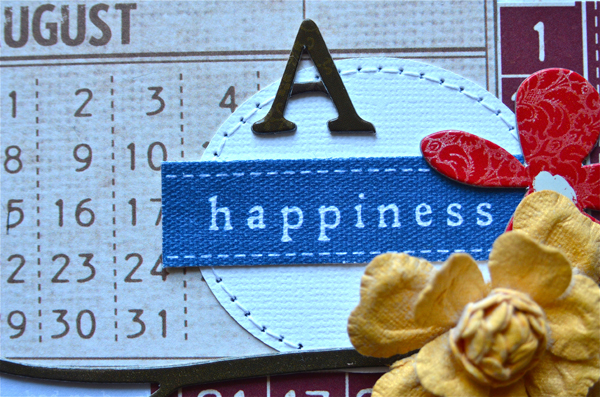 To add interest to the pre-printed leaves, I adhered Doodlebug heart stickers to a trio of them. 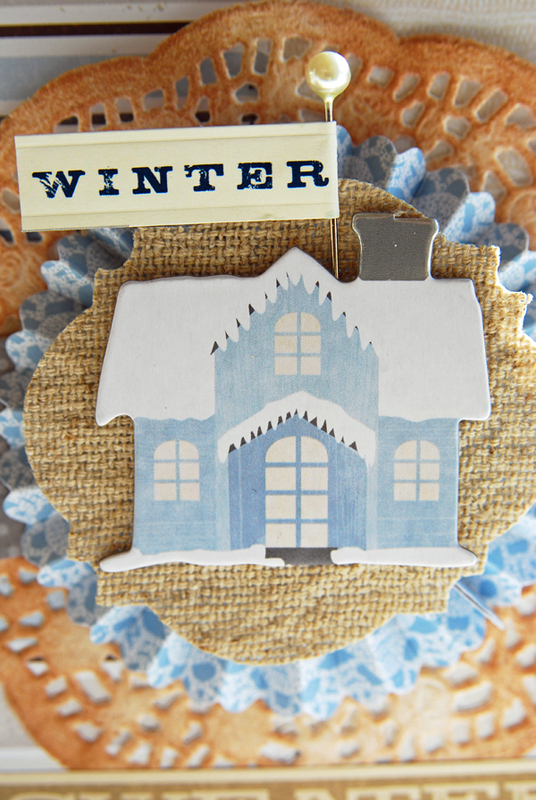 I also added a trail of chipboard leaves to continue the look of the scene and to help lead the eye to the title. Here's a look at the kit I worked with. It was filled with fall goodness from Little Yellow Bicycle Feels Like Home along with bits from Simple Stories Harvest Lane. Thanks for stopping by today! 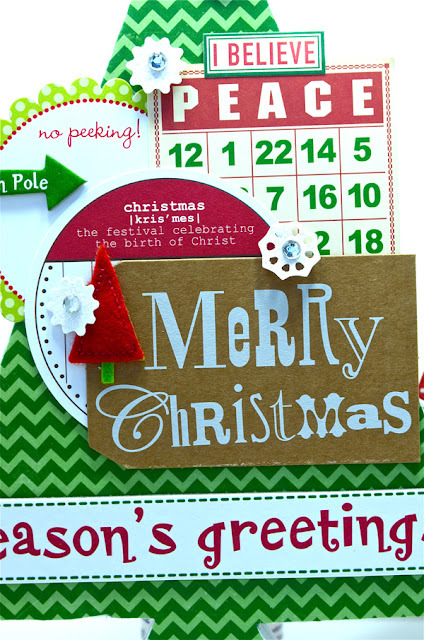 I'll be back tomorrow to share another layout.